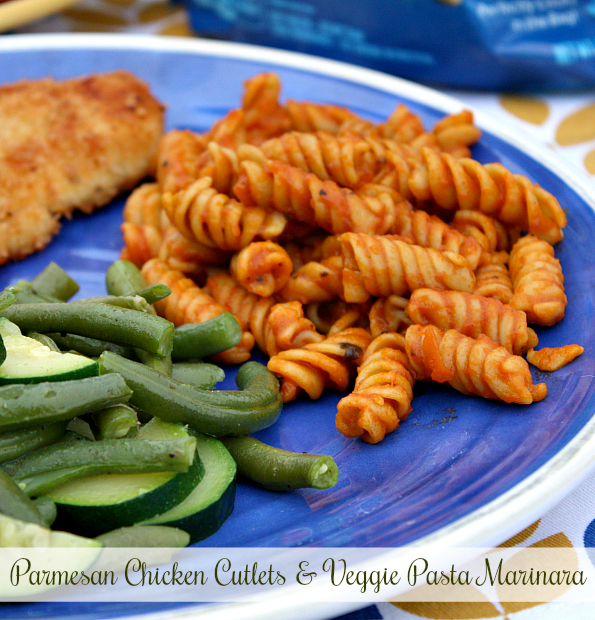 Crispy Parmesan Chicken Cutlets served with Zucchini Lentil Pasta with Marinara Sauce. 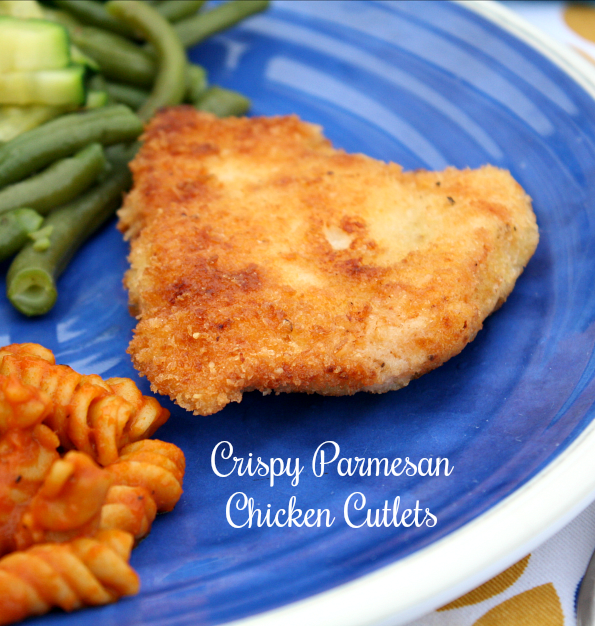 Today I have a simple Crispy Parmesan Chicken Cutlet recipe to share with you. Chicken cutlets are delicious on their own, sliced and topped on salads, added to pasta dishes and perfect for Chicken Parmesan. 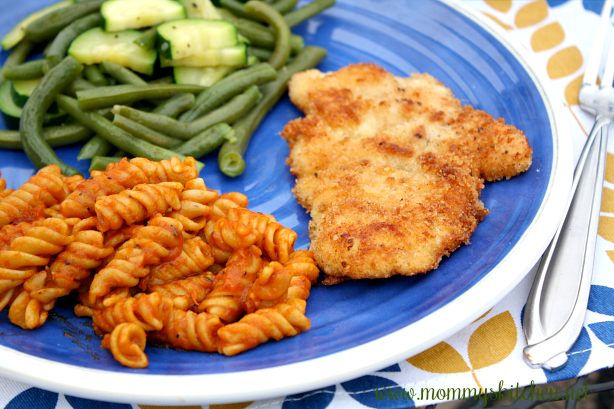 Breaded Chicken Cutlets is a recipe that everyone should have tucked away in their recipe box. If you're not familiar with chicken cutlets they're boneless, skinless chicken breasts that are cut in half horizontally and then pounded flat. Once the chicken breasts are flat each cutlet is dredged in seasoned flour, dipped in an egg mixture, a Parmesan-bread crumb mixture and fried until golden brown and crisp. They're so delicious and super simple to make. I served the chicken cutlets plain with a vegetable side and the new Bird's Eye® Veggie Made™ Zucchini Lentil Pasta coated in a light Marinara Sauce. Have you tried their new Veggie Made™ pasta's? I've been a fan of their convenient Steamfresh vegetable packages for quite some time, but their new vegetable pasta's were new to me. 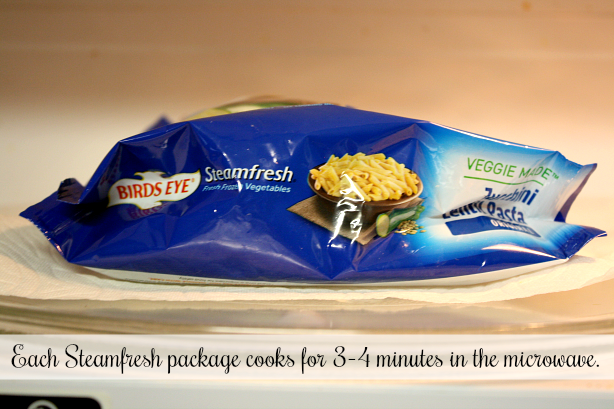 Bird's Eye is all about "swapping the good stuff" and their new Steamfresh Veggie Made™ Pasta's make it easy. The starch in the pasta is replaced with real vegetables (lentils, zucchini and spinach), so each serving provides one serving of vegetables without any artificial ingredients. I have to say I do love the idea of a vegetable pasta! This is such a great way to get your family to eat more veggies, especially if you have picky kids or a picky husband. I have one child who is very picky, so I have to be sneaky and find different ways to incorporate vegetables into his diet without him knowing. I've become pretty good at it, but pasta with vegetables makes it even easier. The Veggie Made™ Pastas come in four varieties, Zucchini Lentil Pasta Original, Zucchini Lentil Pasta with Marinara Sauce, Spinach Lentil Pasta with Alfredo Pasta and Zucchini Lentil Pasta with Cheddar Cheese. The best part is all you have to do is heat the Steamfresh packages in the microwave for 3-4 minutes and they're ready to serve. The original pasta is great for dressing up different pasta dishes or salads. A few of the pasta's come with a sauce making them the perfect side dish to round off any meal. I hope you'll give these new pasta's a try, especially if you need to get your kids to eat more veggies. Let's get started on these simple chicken cutlets. Lay the chicken breasts out on a cutting board. Hold your knife parallel to the cutting board and slice the chicken breasts in half to make two cutlets. My chicken breasts were pretty large so I cut each thin cutlet in half making eight. Place the chicken between two sheets of waxed paper or plastic wrap and slightly pound with a mallet to 1/4 inch thick. Sprinkle salt and fresh ground pepper on both sides. Set out three bowls and add the flour, cornstarch, onion powder and garlic powder. Mix to blend. In the second bowl whisk together the egg and milk. Mix together the Panko bread crumbs, Parmesan cheese and lemon pepper. Dredge or dip the chicken pieces first in the flour mixture (shake off any excess), then in the egg mixture and finally the bread crumb mixture. Place the chicken cutlets on a baking sheet lined with foil and sprayed with non stick spray. Refrigerate for 1 hour. Preheat oven to 200 degrees. Heat the oil in a large nonstick skillet over medium-high heat. Once hot add the chicken cutlets, in batches. Reduce heat to medium and cook for 3-4 minutes on each side. Remove to a paper towel to drain. Season again with a bit of kosher salt and lay the chicken cutlets on a clean baking sheet and place in the oven to keep warm. Continue cooking the second batch of cutlets. Remove cutlets from the oven and place on a serving plate. Serve with a pasta a salad and crusty bread. Everyone loved the meal and no one knew they were eating a vegetable pasta. Lay the chicken breasts out on a cutting board. Hold your knife parallel to the cutting board and slice the chicken breasts in half to make two cutlets. Place the chicken between two sheets of waxed paper or plastic wrap and slightly pound with a mallet to 1/4 inch thick. Sprinkle salt and fresh ground pepper on both sides. Set out three bowls and add the flour, cornstarch, onion powder and garlic powder. Mix to blend. In the second bowl whisk together the egg and milk. Mix together the Panko bread crumbs, Parmesan cheese and lemon pepper. Dredge or dip the chicken pieces first in the flour mixture (shake off any excess), then in the egg mixture and finally the bread crumb mixture. Place the chicken cutlets on a baking sheet lined with foil and sprayed with non stick spray. Refrigerate for 1 hour. Heat the oil in a large nonstick skillet over medium-high heat. Once hot add the chicken cutlets, in batches. Reduce heat to medium and cook for 3-4 minutes on each side. Remove to a paper towel to drain. Season again with a bit of kosher salt and lay the chicken cutlets on a clean baking sheet and place in the oven to keep warm. Continue cooking the second batch of cutlets. Serve with pasta, veggie made pasta with marinara sauce and crusty bread. This looks delicious and it's exactly the type of recipe I need for busy days. I love how simple and quick this is to make. Thanks for sharing this! What an easy meal. I love this recipe and I looks really easy My kids would love all of these items so that would mean a super easy meal for us. No kids complaining!! Love that!! hA! I am so ready to try this. I have a hard time with the kids but I think they would enjoy this. Really interested in the Birds eye pastas. They look delicious! Zucchini Pasta is a thing? Oh, my I have died and gone to heaven. I am going to be hunting these down in my store. My daughter would absolutely love this meal. Aside from loving chicken cutlets and parmesan but we love those birds eye steamed veggies and noodles that you can do in a microwave. We would love this whole meal. I love chicken parmesan meals! I have a different way of preparing it but yours looks great to try :D Thanks for sharing! I'll try whipping this up tonight. I was wondering what I was going to do with chicken breast and when I opened my email and saw this recipe..my answer was in front of my eyes!!! Thanks for such an easy recipe and I made this and it was delicious.